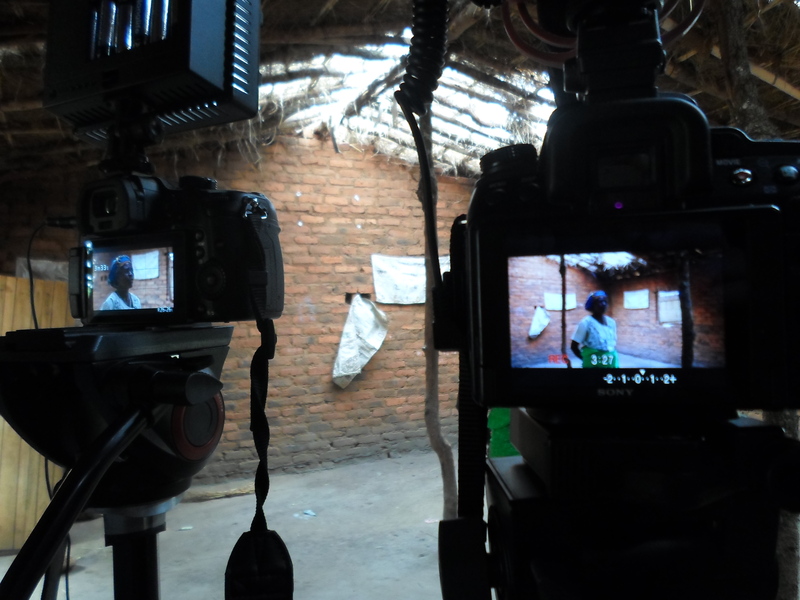 This blog looks at some of the challenges of documenting the many projects across Malawi. 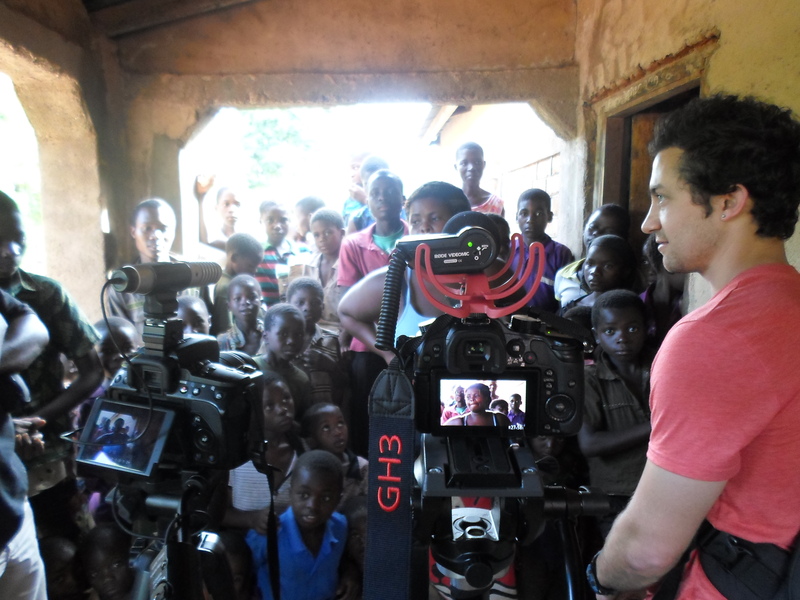 In our latest trip to Malawi, over 20 interviews have been conducted by the Strathclyde team; indoor, outdoor, in searing heat, with the risk of thunderstorms, off the beaten track, in groups, in Chichewa, in English and with a huge variety of background noises. This post will illustrate some of these and comment on the challenges involved. 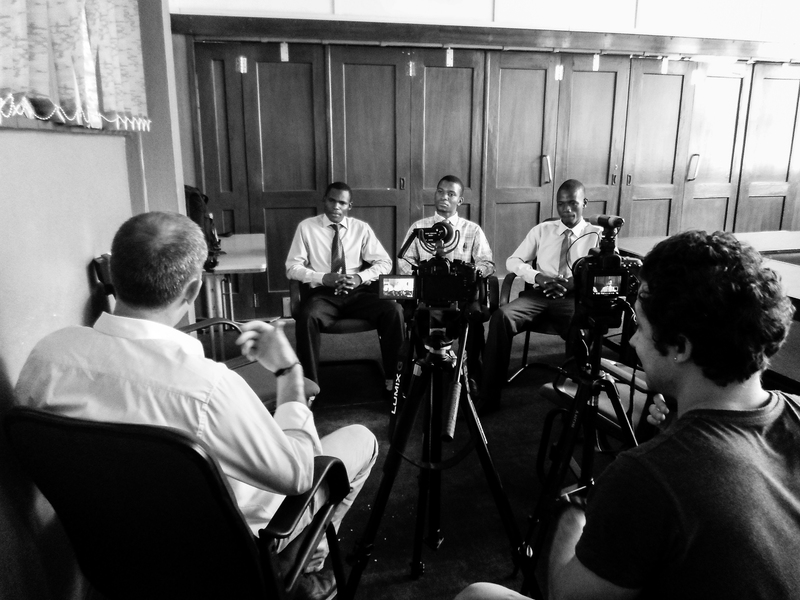 Damien interviewing three students at The Polytechnic. Interviewing groups has additional challenges. In the interview above we tried to engage everyone in the team, but naturally those that are more confident (and comfortable on video) tend to speak up more. On the other hand, sometimes the group dynamics can be quite interesting as interviewees react and respond to each other! Attracting a crowd when filming, especially children, is common. In the case above there was not much that could be done, and it actually enhances the shot. On some occasions it has been necessary to distract the children whilst filming takes place and in others they are happy to sit quietly and watch. Some children have even helped move our tripods for us between shots! For some it is the first camera they have ever seen and they are naturally curious. 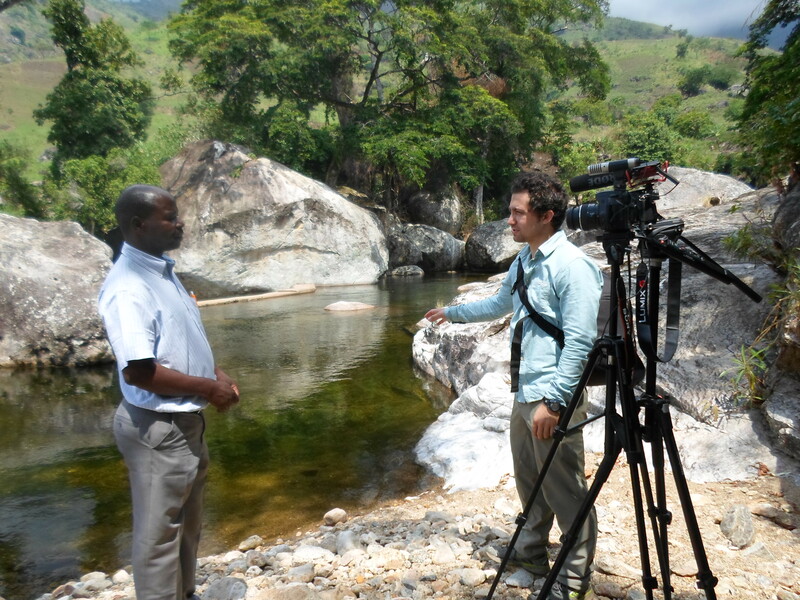 Peter directing Emannuel prior to an interview at the Bondo scheme dam. Background noise affects the final quality of the audio. Filming is undertaken using 1, 2 or even 3 microphones depending on the situation. At Bondo, the water flowing over the dam had an affect on the audio. Other background noises have included a goat sneezing, women dancing, a mosque calling to prayer, various loud birds, chickens clucking and wind. Camera set up showing closeup (left) and wide shots (right). The location is inside an orphan care centre. There were two cameras used in most filming, a Panasonic Gh3 and a Sony A580. Two interchangeable lenses were also used depending on the shot, allowing close ups and wide angle. Two tripods were used during filming as well as camera mounted, interviewee mounted and field microphones. Ensuring the cameras are properly focused at all times! Now we have finished all the interviews there will be a significant amount of video editing. Completed videos will be posted on the blog as soon as they are ready.